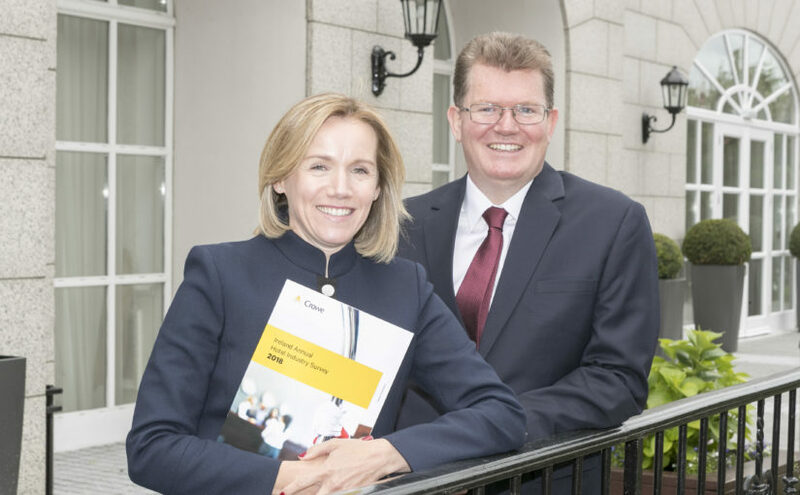 Pictured at the launch of the 2018 Hotel Industry Survey, Mairea Doyle-Balfe, Director and Aiden Murphy, Partner, Crowe. Irish hotel sector occupancy levels at all-time high across Ireland with growth outside capital now outpacing Dublin. The Crowe Ireland Hotel Survey, compiled from an analysis of Irish hotels’ 2017 accounts, shows a seventh consecutive year of growth in turnover with record profit levels, room occupancy levels and average room rates recorded across all regions. Hotel room rates have increased in all regions, up 6.9% on average rates achieved in 2017 when compared with 2016. During 2017, the South West and Western Seaboard regions were the strongest performing areas, with average room rates for both regions rising to €100.67 and €87.49 respectively, a growth of 8.0% in the South West and 9.7% in the Western Seaboard area. Rooms in Dublin hotels recorded average rate of €136.96 in 2017 some 6.8% higher than the price achieved in 2016. During 2017 average room rates in Dublin increased at half the rate achieved in 2016 showing some moderation in growth even with very limited new supply. For the first time since 2011, average room rate growth in regions outside Dublin was higher than the capital pointing to a broader, more balanced recovery in the sector across the country. Profitability in the capital too increased at a lower rate when compared with other regions. Dublin hotels increased profits on average by 12% whereas the largest increase in profitability was achieved in the South West at 17.4% with Western Seaboard at 17% and Midlands & East at 13.9%. Occupancy levels have also increased across all regions and are now over 70% occupancy, with the exception of Midlands & East who are just shy of the 70% mark at 69.5%. 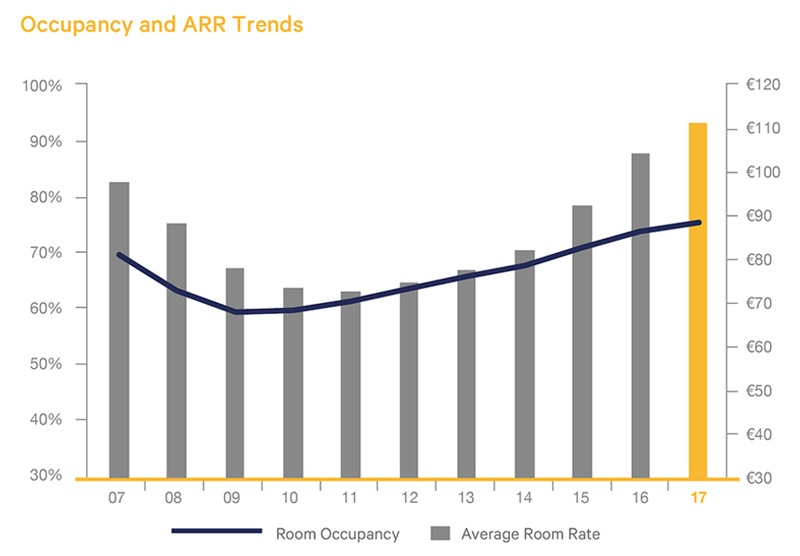 Overall, the average room occupancy levels across all hotels are now at 75.4%, an all-time high, while Dublin remains the area with highest occupancy levels at 83.5% in 2017. Luxury hotels saw the biggest increase in room occupancy in 2017, with a 2.7 percentage point increase on 2016 figures. Their average room rate rose to €218.02, an increase of 6.2% on last year’s record level of €205.24. While First Class (four-star) hotels have the highest level of room occupancy at 76.2%, economy hotels saw the biggest growth in the average room rate, growing to €68.43 and an 11.8% increase on 2016 figures. To order your copy of the 2018 Hotel Industry Survey please contact Sinead O’Rourke.